Native New Orleanian Poppy Tooker presents a classic Big Easy Thanksgiving dinner natives will recognize and newcomers will savor. The renowned chef, cooking teacher and radio-show host shares nine recipes that aptly represent the rich flavors and history of the region—and are sure to jazz up your Thanksgiving menu. 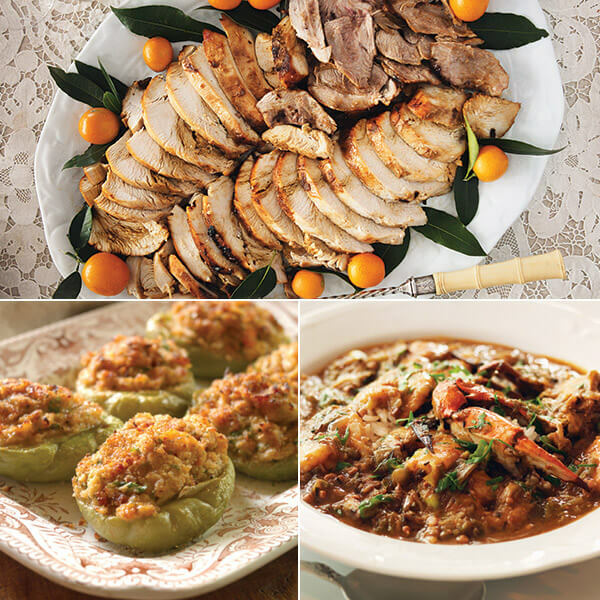 Ready to add authentic Southern flair to your Thanksgiving feast? Let’s dig in! “This is the perfect way to start a meal; the flavors are so bright,” says Poppy. “This is my most-sought-after recipe. Nobody takes a cooking class in New Orleans from me without learning how to make gumbo,” says Poppy. Serve this classic Creole dish over cooked rice. “I will never roast a turkey again in this lifetime, and it’s my bet, once you fry your first turkey, your bird will never be relegated to the oven again,” says Poppy. “Bread stuffing would never have had a place in the rural parts of Louisiana where Mamman was from because wheat didn’t grow there,” Poppy explains. “Down here, we’re all about rice.” Poppy also offers these additional side dishes to add to your Thanksgiving table: Meat Dressing and Peas in a Roux. “Mamman’s bread pudding made a big impression on me as a small child when it would come to the table dripping with sauce and filled with plump raisins and pecans,” Poppy remembers. Additional sides to try: Meat Dressing and Peas in a Roux. Poppy Tooker is a lifelong New Orleanian who champions New Orleans food and culture. She hosts Louisiana Eats!, a weekly, NPR-affiliated radio show, and appears every Friday on Steppin' Out, an arts and entertainment show on WYES television. In between shows, she writes about food, teaches classes and makes sure her three Chinese pugs are fat and happy!